What is your new book, Lunch Wars, about? Lunch Wars is a guide for parents and school administrators who want to know how to create a sustainable, delicious and healthy school food system in their district. How did your experience at Integrative Nutrition inspire you to write the book? So much! I had just been accepted into a PhD program when I happened to read the brochure for IIN and realized that I didn’t need seven more years of school and that the education described in that brochure was exactly what I wanted. I’d been a filmmaker for 25 years, and my year at IIN gave me the confidence to make an independent feature documentary about school food, Two Angry Moms. IIN brought me back to speak to students and the response I got from students, alumnae, parents and others in the holistic health field was overwhelming! How did you first get involved with the fight for healthier school lunches? I had long been concerned with the quality of food in our country – first because of my own health issues, many of which I had resolved by eating organic whole foods – and later because I wanted to feed my children as healthily as possible. When I read the headlines from the CDC, that this generation of children would be the first in our nation’s history to lead shorter lives than those of their parents, I decided that I would make an independent film focused on what kids eat. I narrowed the topic down to school food when I realized that schools had fallen prey to the junk food culture and were regularly promoting highly processed, chemicalized junk as part of a “healthy” meal. The movement for better food in schools is every bit as much about education as it is about the lunch menu. Why do you recommend that parents read your book? School food is a huge, multi-billion dollar institution, and it REALLY helps to understand how the system works in order to change it. The book details the inner workings of the school food system in terms that non-professionals can understand. My favorite parts of the book are the stories and profiles about people and school districts that have re-created their school food systems from the cafeteria to the curriculum. I learned so much from these examples - from big cities, suburbs and rural communities – and I think they are great models for everyone to draw upon. Parents who go to their administration armed with knowledge will also have a good dose of empathy for the challenges involved in creating positive change. What do you feel is the most important step in creating healthy school lunches? Most important is cooperation and working with the entire school community. Everyone – students, parents, teachers, lunch ladies, custodians, school board members and even local business owners and farmers – must be part of the conversation. What are three steps that parents can take to change school lunches in their communities? 1) Host a Screening of Two Angry Moms. With this first step you will meet and join forces with other like-minded adults who recognize that our kids do better and feel better in a healthy school food environment. Download our screening planner and get started! 2) Network – join www.angrymoms.org to reach a national tipping point where healthy and delicious school food becomes the norm. Visit. 3) Have Lunch With Your Child in the School Cafeteria. Understand the strengths and weaknesses of your school’s lunch program by experiencing the food your kids are taking in at school every day. Ask to see ingredient lists for all the food on the menu. Use this information to help write policy and contract specifications. Where can your book be purchased for pre-sale? Follow the links on the home page of angrymoms.org to pre-oder your copy of Lunch Wars, which will hit the shelves on August 18th. Want to hear more of what Amy has to say? Tune in to our webinar with Amy on Tuesday, July 19 at 12 PM EST to hear her share her experience as a student at Integrative Nutrition and how she found the confidence to become an "angry mom." We also have another very special offer for you! 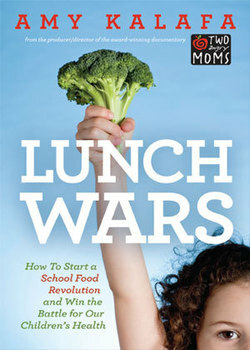 Anyone who pre-orders Lunch Wars from any of the online book retailers listed on angrymoms.org will be given special access to a two part tele-class with Amy Kalafa, where she will go into even more detail about the book and what you can do to make a change in your school district. Just remember to email your receipt to lunchwarsbook@gmail.com after you purchase your copy to save your spot in the class.